Paddy Breathnach’s highly anticipated new drama ‘Rosie’ opens in Irish cinemas nationwide - Friday, October 12th. Having already received a number of rave reviews following its world premiere at the Toronto Film Festival in September, ‘Rosie’ will make its UK debut at the BFI London Film Festival later this month. 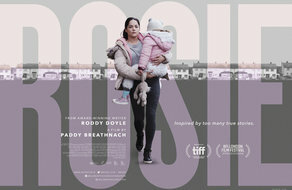 A sobering portrayal of the Irish housing crisis currently taking place in the country, ‘Rosie’ tells the story of a mother trying to protect her family after their landlord sells their rented home and they become homeless. Over 36 hours, Rosie and her partner John Paul strive to find somewhere to stay while shielding their young family from the reality of the situation around them. ‘Rosie’ examines how even in times of crises; the love and strength of a family can endure. Paddy Breathnach (I Went Down, Viva) directs ‘Rosie’, a film that explores the quietly apocalyptic ramifications of Ireland's housing crisis, from a screenplay by Roddy Doyle (The Commitments, The Snapper) and starring Sarah Greene (Penny Dreadful, Rebellion, Black 47) in the title role, alongside Moe Dunford (Vikings, Handsome Devil) as her partner John Paul. ‘Rosie’ is produced by Emma Norton, Rory Gilmartin and Juliette Bonass. Roddy Doyle serves as Executive Producer alongside Ed Guiney and Andrew Lowe for Element Pictures, who previously brought us The Lobster and Room. Dearbhla Regan is executive producer for Screen Ireland. ‘Rosie’ was shot in and around Dublin and is backed by Fís Éireann/Screen Ireland, The Broadcasting Authority of Ireland, RTÉ and Element Pictures Distribution.